Nothing adds more to a landscape than a beautiful Water Feature. For homeowners who own these wonderful Waterscape, lighting is a key element to making it stand out. It brings the Feature along with he entire Landscape alive at Night! Pond, Waterfall and Fountain lights are available in a variety of styles and are simple to install. Depending on the positioning of the lights they can be used to illuminate the area from underneath the water or placed to cast a reflective ambiance on the water surface providing a incredible view when the sun goes down. When deciding on what lights to get it is best to choose based on the space you want to illuminate. 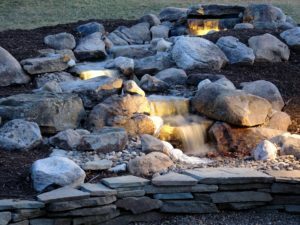 Some choose to light small sections off the Water Feature as accessories to subtly enhance their entire landscape. Other people will choose to Feature elements like Waterfall to make them the main focus. For this you must be sure the lights are powerful enough to provide enough light for the desired area. LED Spot lights are a go-to for most Water Features. 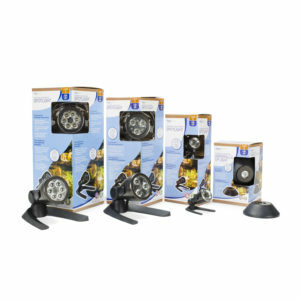 They are ideal for highlighting waterfalls, decorative fountains and other focus point in and outside of the water. They Typically come in 3 bulb options consisting of 1, 3, and 6 Watt bulbs. Also the LED Waterfall and Up Light is Small and easy to tuck into small places, they can be used inside or around waterfalls, under overhangs or behind cascading water. 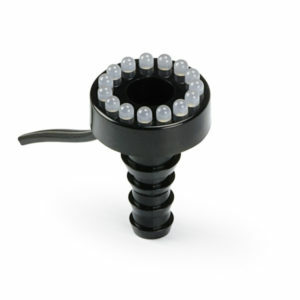 For decorative fountain owners the LED Fountain Accent Light is great for creating a shimmering affect with the Water. It’s important to always devise a plan before anything else when installing water lighting. Think of how you vision your feature with the lights. For design consider making a rough sketch to plan your placement and include power requirements and potential safety limits. Combing Water & Electricity can prove to be a difficult task. You must consider many different variables. If hesitant or nervous from a safety standpoint you may consider hiring a professional. Even a simple consultation can provide guidance and pointers for a safe lighting installation. You will be amazed what just a few lights can do to a landscape. If considering a Water Feature or already a proud owner of one introduce a few lights and it can have a drastic effect. You will want to spend many more evenings out by the pond and it certainly adds to the Lifestyle.